Across from the Foreign Office Building in the center of the street is the United Kingdom's national war memorial, the Centotaph. It is a focus of remembrance for the British and Commonwealth dead of both World Wars and the British dead of later wars. In 1919, Prime Minster David Lloyd George asked Sir Edwin Lutyens to design a temporary memorial that would be used during the Peace Day Parade following the signing of the Treaty of Versailles, which officially ended the First World War. After the parade, the public continued to place flowers at the temporary memorial so it was decided to build a permanent structure there. It was unveiled on Armistice Day (11 November) 1920. Originally, the Cenotaph was to be a memorial to those who died in the First World War. However, after World War II, its role was expanded to encompass that conflict. Subsequently, it was expanded to include later wars in which British service men and women have fought. 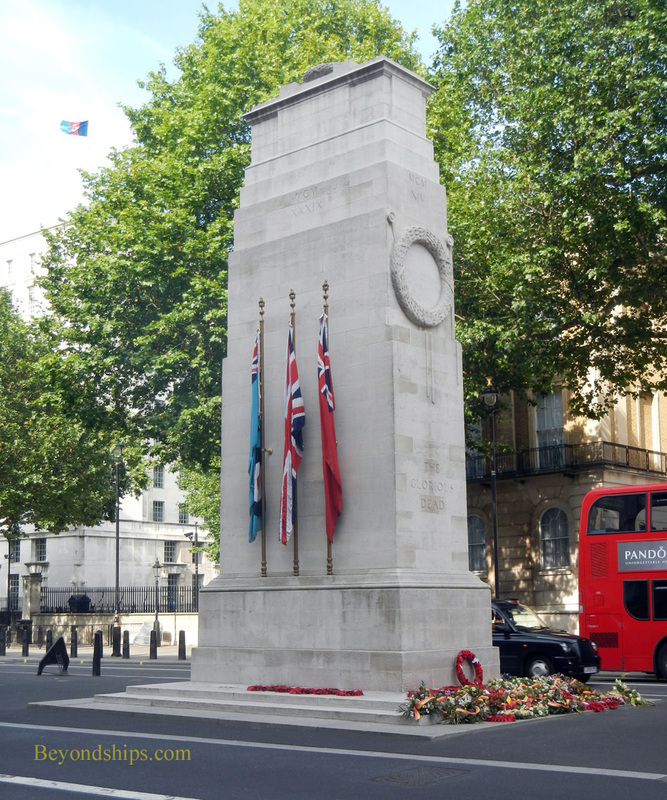 Each year on Remembrance Sunday, the Cenotaph is the site of the National Service of Remembrance. 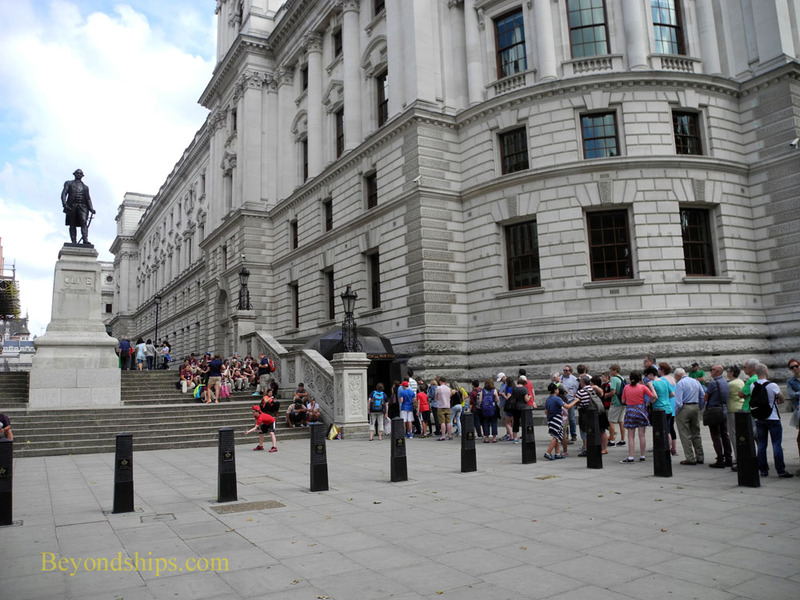 On the right hand side of Whitehall, you will see a security checkpoint between two government buildings. There is often a crowd milling about it as this is the entrance to Downing Street. No. 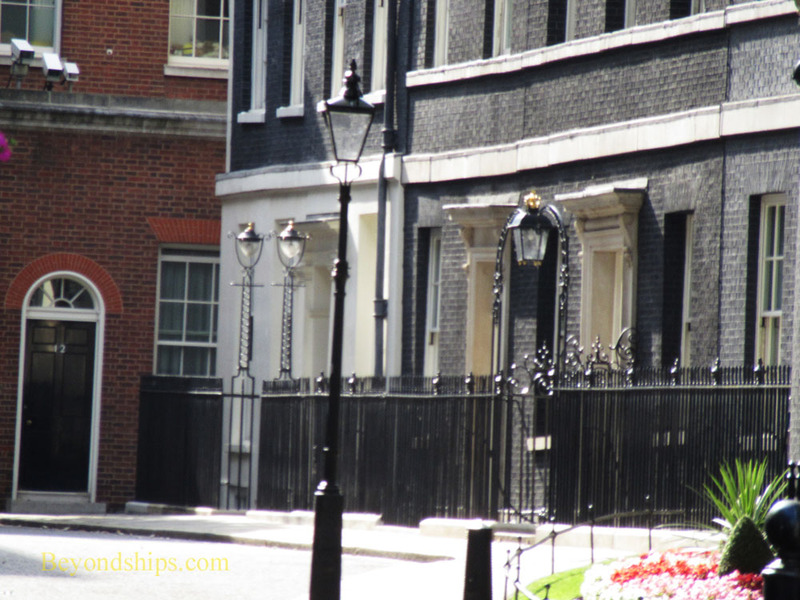 10 Downing Street is the official residence and office of the Prime Minister of the United Kingdom. It is also used for receptions, dinners and entertaining foreign leaders. This site was once occupied by a medieval brewery. The first residential house was built there in Elizabethan times. However, that was demolished in the 1680s when George Downing built a row of terraced houses here including the current No. 10. Although Downing had Sir Christopher Wren design the buildings, they were built cheaply, using inferior materials. This would plague the buildings over the centuries. The first prime minister to occupy No. 10 was Robert Walpole who persuaded George II to grant the house not to him personally but to all who would serve as prime minister. In the 18th and 19th centuries a majority of the prime ministers preferred to use their own London houses. However, all modern prime ministers have lived and worked at No. 10. Although efforts to refurbish No. 10 go back at least to when Benjamin Disraeli was prime minister in the 19th century, extensive reconstruction and restoration work was done during the second half of the 20th century. During one of these projects, it was discovered that the facade of the building is actually yellow and that it only appeared to be black because of centuries of pollution. However, because people were so used to seeing the building black, the yellow bricks were painted black. ﻿Above: Downing Street as seen from Whitehall. No. 10 is actually much bigger than it appears on the outside. Before Walpole moved in, the original townhouse was connected to the building in back, which looks over Horse Guards Parade. Today, it is also connected to No. 12 Downing Street via a corridor that runs through No. 11, the official residence of the Chancellor of the Exchequer. Underneath the building now occupied by H.M. Treasury lies a complex of rooms of unique historical significance. These rooms were used by Winston Churchill and his government in leading the British war effort in World War II. The entrance to the Churchill War Rooms is not on Whitehall but rather on the St. James Park side of the building. However, you can easily get there from Whitehall by going through an ornate set of arches and walking along King Charles Street. In the late 1930s with the situation in Europe deteriorating, the British government became concerned about aerial bombing in the event of war. Consequently, a sheltered command center was created under the Treasury building for use by the Prime Minster and his War Cabinet. War did come and the command center was put to use. Here, Churchill worked with military leaders, conferred via transatlantic telephone with U.S. President Franklin Roosevelt, broadcast speeches and met with his cabinet more than 100 times. The complex also includes a bedroom made for Churchill's use but he rarely used it, preferring to sleep at nearby 10 Downing Street. At the end of the war, the doors were closed and the command center was left as it was when Japan surrendered. In 1984, upon the urging of Prime Minister Margret Thatcher, the complex was opened to the general public. Subsequently, under the care of the Imperial War Museum, additional areas have been opened as well as a museum on the life of Winston Churchill. 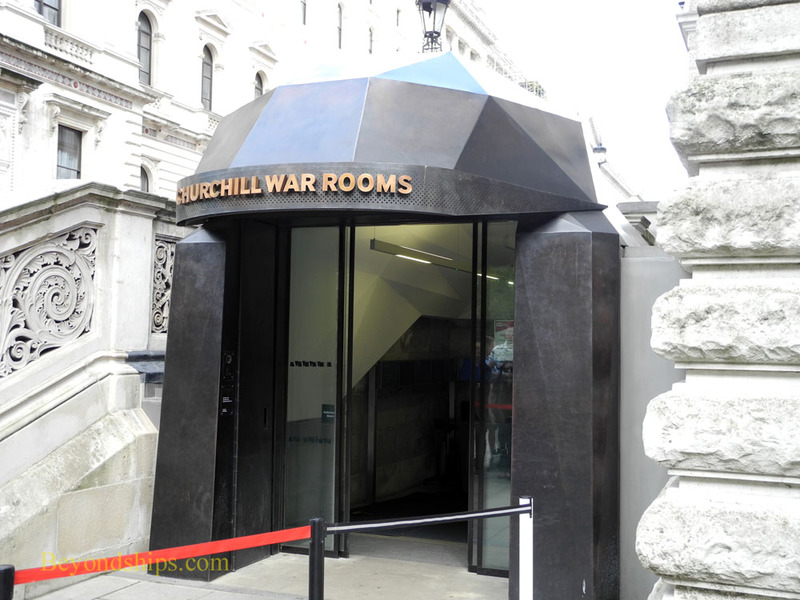 The Churchill War Rooms transport you back in time to a grim period in human history and underscore the seriousness of the struggle against Fascism. You see the map room with the pinholes marking the progress of Allied ships. You see the Spartan room where the War Cabinet conferred and made crucial decisions. There is no natural light or decoration. Nothing detracted from the business of the task being performed here. For more information, see the Imperial War Museum website.